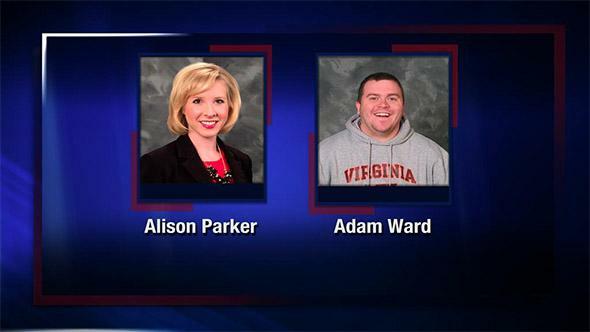 Virginia TV on-air attack: Reporter, cameraman apparently killed by former colleague. Two of the victims of the shooting. The third, the interview’s subject, was taken for emergency surgery. Update, 6:00 p.m.: Here’s what we know about Wednesday morning’s on-air shooting. At the moment of the shooting, Parker was interviewing a Chamber of Commerce figure named Vicki Gardner on live TV in Moneta, Virginia. Gardner was reportedly shot in the back and is in stable condition after surgery. The sound of gunfire was captured on the live broadcast, though no wounds or injuries were visible before Ward dropped his camera. The camera captured a brief image of the shooter. The shooter was a 41-year-old former WDBJ7 reporter named Vester Flanagan who had used the name Bryce Williams on-air and had been fired in 2013. A first-person recording of the shooting apparently taken with a GoPro-like device was posted later Wednesday morning to Twitter and Facebook accounts under the name Bryce Williams. The Twitter account accused Parker of having made racist comments at some point in the past and said Ward had complained about Flanagan/Williams to WDBJ7’s human resources department. 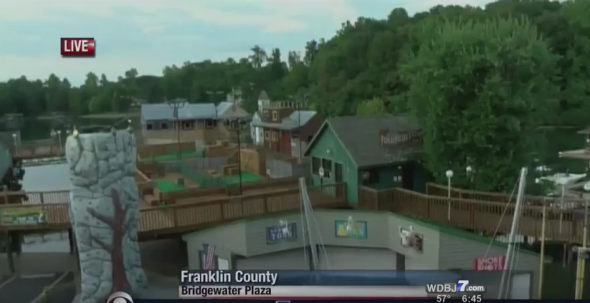 WDBJ7s general manager said Flanagan had filed complaints about the station to the Equal Employment Opportunity Commission that were determined to be unfounded. Flanagan sued an employer in Florida for racial discrimination in 2000 and settled the case out of court a year later. A 23-page document Flanagan faxed to ABC at 8:26 a.m. cited racial discrimination, sexual harassment (Flanagan was gay, the document says) and the Charleston church massacre as motivation for Wednesday’s attack. Flanagan was spotted on Interstate 66 in or around Markham, Virginia by state police at approximately 11:30 a.m. and crashed after a brief chase. He reportedly suffered what appears to be a self-inflicted gunshot wound and died shortly thereafter at a hospital. Markham is approximately 190 miles from the site where Parker, Ward, and Gardner were shot. Update, 2:25 p.m.: ABC reports that Flanagan sent a 23-page fax identified as a “Suicide Note for Friends and Family” to ABC News at 8:26 a.m. Wednesday morning. The document, ABC says, complains of discrimination that Flanagan has faced as a “gay, black man” and cites the June 17 Charleston church shooting as the “tipping point” that motivated Flanagan to kill Parker and Ward. (Flanagan is believed to have accused Parker of making racist remarks and had accused a past employer of racial discrimination.) The document also reportedly expresses solidarity with the perpetrators of past massacres at Virginia Tech and Columbine High School in Colorado. 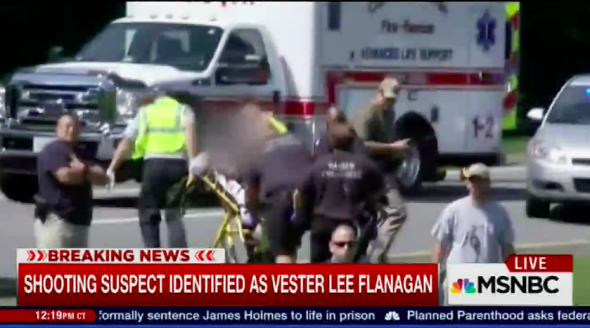 Update, 2:05 p.m.: Virginia’s secretary of public safety has announced that Flanagan died at a hospital at 1:26 p.m.
A screen shot that seems to show shooting suspect Vester Flanagan being taken away from the location where he crashed his vehicle and suffered what appears to have been a self-inflicted gunshot wound. Update, 12:15 p.m.: WDBJ7, the outlet that the victims worked for, has cited state police in retracting its report that Williams/Flanagan died of a self-inflicted gunshot wound. He is said to be in critical condition. Update, 11:55 a.m.: Multiple outlets are reporting that Williams/Flanagan shot himself after being confronted by law enforcement agents on the I-66 freeway. Some outlets are reporting he has died. 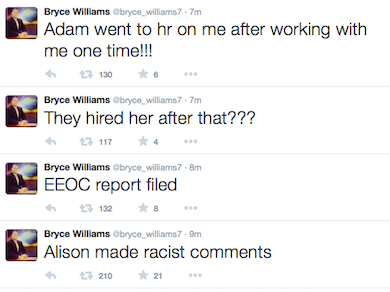 Update, 11:40 a.m.: Here’s a screencap of the “Bryce Williams” Twitter account that has been suspended. After the tweets pictured, the account posted a first-person-perspective recording of the shooting. Update, 11:30 a.m.: A Twitter account purporting to belong to Vester Flanagan/Bryce Williams posted a recording, filmed from the shooter’s perspective, of victims Alison Parker, Adam Ward, and Vicki Gardner being shot. The account, which was suspended minutes ago, also included a recent tweet that accused Parker of making “racist comments” and implied that Ward had unjustly reported Flanagan/Williams to the company’s human resources department. Update, 11:15 a.m.: Several outlets are reporting that law enforcement officials are trying to locate a former WDBJ7 employee named Vester Flanagan who reported on-air for the station using the name Bryce Williams. CNN says police “stopped short” of calling Flanagan a suspect but that he is being sought in relation to the shooting. Update, 11:00 a.m.: A TV reporter named Henry Graff has passed along a statement from the Virginia state police that seems to contradict earlier reports that officers were pursuing a suspect on the I-81 freeway. Original story, 9:49 a.m. A Roanoke, Virginia TV reporter and cameraman were killed Wednesday morning and their interview subject was injured during an on-air attack by what appears in some still images (though less so in others) to have been a masked gunman. You can see the incident on YouTube. Be cautioned that it is very disturbing, though not graphic per se. The interview that was interrupted at approximately 6:45 a.m. was a seemingly innocuous one about a shopping center. Alison Parker, the WDBJ7 reporter, was 24. Adam Ward, the cameraman, was 27. Interview subject Vicki Gardner, the executive director of the Smith Mountain Lake Chamber of Commerce, was reportedly shot in the back and taken for emergency surgery. An anchor at the station, Chris Hurst, tweeted that he and Parker were “very much in love” and had recently moved in together. Hurst also said that Ward, the cameraman, was engaged to be married. CNN says Ward’s fiancée is a newsroom producer at WDBJ7. *Correction, Aug. 26, 2015: This post originally misspelled Roanoke. This post is being updated with new information.